Founded House founded in 1789 during the Revolution and the Chiquet brothers, since the 1980s, have continued the revolution! We have here the best that Champagne can produce in terms of wines of terroir with distinctive personalities. Champagne Jacquesson was founded in 1798 by Memmie Jacquesson and he did so well that Napoléon gave him a medal. In 1835, his son Adolphe took over and had a direct hand in several important innovations. 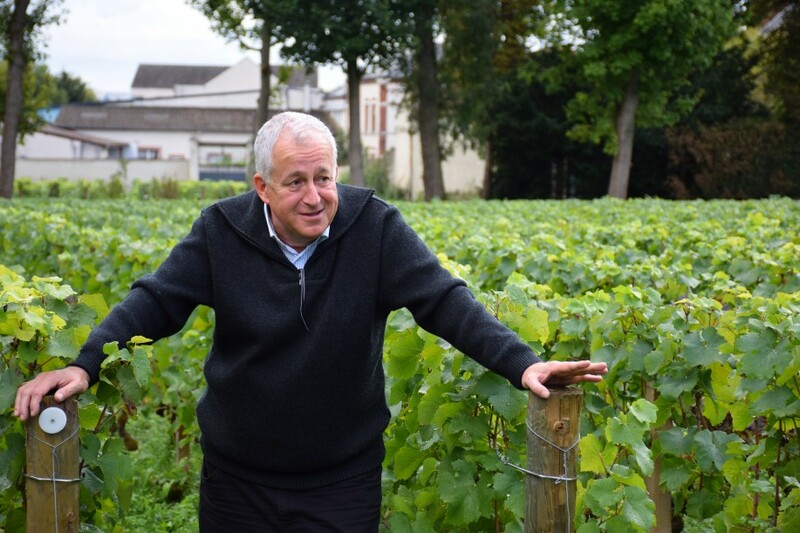 He instituted the radical notion of training vines in rows with the collaboration of Dr. Guyot. He established a base level of sugar in bottles with the aid of a chemist, thus substantially reducing the problem of bottle explosion. Lastly, he patented the wire basket known as the muselet, still used today to hold sparkling wine corks in place. The business left family hands toward the end of the 1800s, and eventually was bought by the Chiquet family in 1974. Today Jacquesson is jointly managed by Jean-Hervé and Laurent Chiquet. Jean-Hervé, once the cellar master, now primarily runs the commercial aspects of the business, while his younger brother Laurent runs the production side and has taken the role of chef de cave. The two work closely with their vineyard manager, Sylvain Leblanc. In a given year, Champagne Jacquesson farms between 69 and 76 acres in the grand cru villages of Aÿ, Avize, and Oiry, and in the premier cru villages of Hautvillers, Dizy, and Mareuil-sur-Aÿ. The acres vary because the house owns 69 acres with the option to take farming contracts on as many as 7 more, and Jacquesson does all of the farming on whatever it contracts for. In addition, from these same villages the Chicquets have buying contracts to buy grapes from 20 acres from growers with whom they work closely (it was 27 acres until 2008, when they parted from their largest grower in a step toward self-sufficiency). 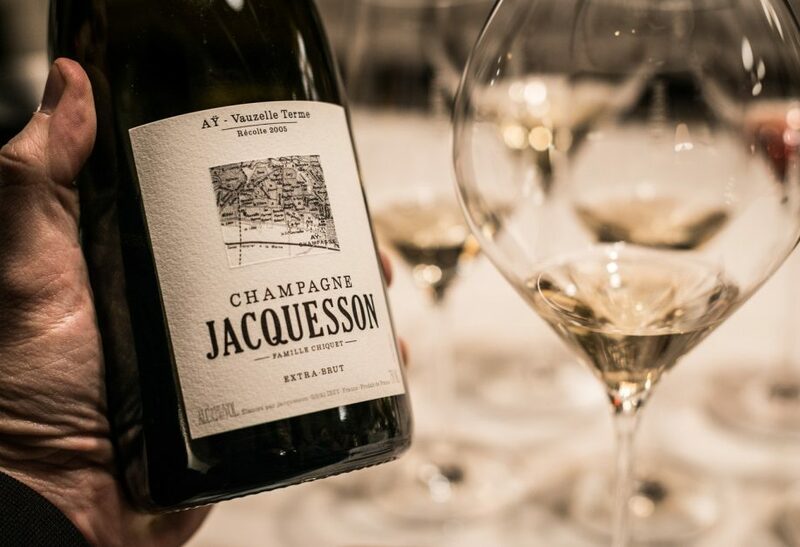 In Champagne terminology, it would be more accurate to call Jacquesson a large grower rather than a “house” because 80% of its production comes from its own vines. Sustainable practices are the norm here, and one-third of Jacquesson’s vineyards are certified organic. No herbicide is used, and two-thirds of the vines are tilled while one-third is sown with cover crops. When fertilizers are used, they are entirely organic. Pruning is severe for low yields, there are no green harvests, and canopy management is stressed to ensure minimal mildew and odium pressure, thus holding fungicide sprays to two each year. Jacquesson has a small production facility in Dizy, across the river from Epernay. Here the brothers use vertical presses rather than more abusive horizontal presses. Only juice from the first pressing is used—the press wine itself is sold to négociants—and of course all the juice is either from grand cru or premier cru rated vineyards. The juice flows by gravity into steel tanks for 24 hours of settling, after which it is transferred to large neutral wood casks (foudres) for several months to undergo alcoholic and malolactic fermentations. The initial fermentation is normally spontaneous while secondary ferments are sometimes spontaneous, sometimes inoculated (with neutral Champagne yeast that originally came from Cramant and Chouilly). The lees are stirred twice monthly to enrich the wine, a practice that has the additional benefit of providing a naturally reductive environment, keeping the need for SO2 additions to a minimum–one at pressing and another at disgorgement. The first racking normally occurs in April or May. Malolactic fermentation is never blocked because 1) this would require a lot of SO2; and 2) low acidity in Champagne grapes is not a concern this far north—the 49th parallel, which is the border between the USA and Canada, runs just above Avize on the Côte des Blancs! Starting with the 2016 vintage, élevages go for twelve months, meaning that the wine is put into bottle to age sur latte after the next harvest. Since the fruit that makes the wine always attains an enviable level of ripeness, the dosage is typically in the extra-brut range of one to six grams of sugar per liter. Bottling is done without cold stabilization or filtration. Care is taken with the labels to transparently detail all relevant information about the wine without marketing flourishes. (Jacquesson helped pioneer such honest and unadorned back labels). The house produces between 25,000 and 28,000 cases of wine each year. So much for the practical aspects. Philosophically, the Chiquet brothers have embarked on a mission to make Champagne as fine wine. This has involved a twofold approach: a fundamental reconsideration of their non-vintage wine, and a move toward single-vineyard wines in an exploration of specific terroirs. In 2003 Jacquesson jettisoned its Brut Perfection NV in favor of a new non-vintage wine named Cuvée 728 (the number comes from the year 1898, when the house revamped its administration and began keeping new records of every wine it made, beginning with number 1). Cuvée 728 was the first in a series of non-vintage wines whose identities are grounded in the primary vintage of their composition. This sounds straightforward, but it goes directly against the grain of the prevailing concept that a house’s non-vintage wine should be a consistent product without regard for differences in years. The aim of the 7-series is to emphasize the best qualities of a given year, rather than to dumb down individual vintages in an effort to make a uniform non-vintage. It’s worth noting that this series is being aged progressively longer in bottle, so that by the time Cuvée 734 was released in May, 2010 it had a full three years of bottle age, including four months after disgorgement. The 7-series then led the brothers to question their classic vintage Champagne. Like most houses, the classic vintage was made only in the best years and was intended to be the best blended wine of the house in those years. But Jean-Hervé and Laurent had decided that the 7-series would be Jacquesson’s best blended wine. Thus the decision was taken that the 2002 Millésime would be the final vintage bottling of the house. Going forward, the vintage wines would be limited to the four single-vineyard wines, made only in good years and in very limited numbers, while the house’s one blend would be the 7-series. The requirements for the vintage-dated single vineyards are simple: the wine must have a distinct personality, one that reflects its terroir, and it is not needed in the 7-series blend. Today, the 7-series represents roughly 95% of Jacquesson’s production. The vineyard sources have essentially remained the same since the advent of this series: parcels in the Marne Valley and along the Côte des Blancs growing in the grands and premiers crus communes of Aÿ, Dizy, Hautvillers, Avize, and Oiry. The basis has long been Chardonnay with roughly 20-25% each of Pinot Meunier and Pinot Noir. As John Gillman has observed, it would be more accurate to view the 7-series as a vineyard style rather than as a NV house style. Thanks to Jeff Bramwell for the bottle shot of Vauzelle Terme. Cuvée 740 Chardonnay makes up about half the blend, with a quarter each of the two Pinots. Cuvée 740 is based on the excellent 2012 vintage. It is the first 7-series to use around 20% reserve wines rather than the previous norm of around 30%, and it is the first to have most of this reserve wine come from older 7-series blends rather than the house's standard stocks of reserve wines. The winter of 2012 was cold, with the spring and early summer being very wet, resulting in serious attacks of mildew. The latter half of the growing season saw superb weather, however, giving grapes of remarkable quality albeit low quantity (the production of 740 is 20% less than that of 739). 195,836 bottles, 7,696 magnums, and 250 jeroboams. Letter from Jean-Hervé on the 740. Cuvée 741 Chardonnay, Pinot Meunier, Pinot Noir Jacquesson's vineyards, located in the northern end of the Côte des Blancs and in the Grande Vallée de la Marne, largely escaped the difficult rains coming at harvest in 2013 that affected other zones in the appellation (the Aube and northern part of the Montagne de Reims in particular). Cuvée 741 is based on 2013 and its quality may come as a surprise for those guided by vintage reports. 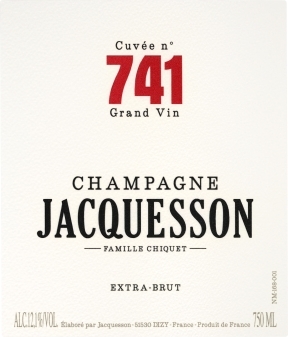 This wine follows the immensely successful 740, based on 2012, and tasting the two wines side by side is fascinating--and a study in contrasts for anyone wanting to understand why Jacquesson abandoned the NV concept of consistency in favor of the 7-series. The wines share Jacquesson's hallmark breadth, complexity of flavor, and finesse, but the aromatic and flavor components differ markedly. The winter of 2013 was very cold and snowy, with spring and early summer staying cold and damp, causing coulure and millerandage as well as delaying the flowering. August and September, however, were warmer and drier, giving a late but excellent harvest. The Pinot Noir from Ay and Dizy and the Chardonnay from Avize were especially successful. Roughly 20% reserve wine was included in the blend. Cuvée 736 Dégorgement Tardif Cuvée 736 late-disgorged is based on the great 2008 vintage (a fact that we could not directly state on the back label because of rules regulating non-vintage and vintage wines, so instead we made the Lot number be the vintage). 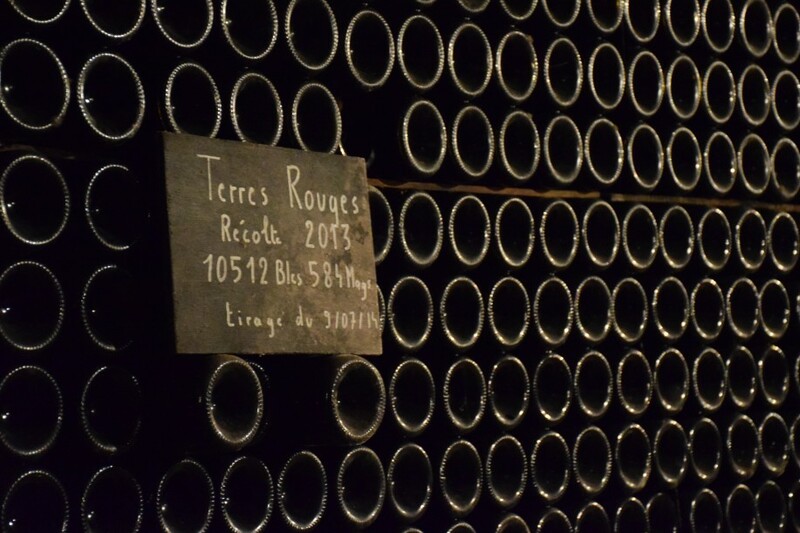 Twenty thousand bottles and one thousand magnums were held back from the original tirage and were aged for eighty-eight months on their lees, then disgorged in November 2016. Cuvée 737 Dégorgement Tardif Cuvée 737 late-disgorged is based on vintage 2009. This wine spent 90 months on its lees under cork (rather than crown cap); 14,640 bottles and 660 magnums were disgorged in November 2017. Following a rainy spring, the summer of 2009 was dry and warm in Champagne and the weather at harvest was magnificent. The grapes were harvested in superb shape and had a maturity similar to 2002. Chardonnay During the 1990s the Chiquets were improving their farming and re-discovering their terroirs. Their one hectare (2.5 acres) of Corne Bautray Chardonnay way up on top of a steep hill above Dizy particularly impressed them in the harvest of 1995, and they made an experimental cuvée from it (2000 was the first commercial release). The parcel occupies the very top of the steep hillside far above Dizy. Planted in 1960, the vines face southwest and grow in relatively thick alluvial topsoil. This soil is a layer of loose clay-silt packed with pebbles, giving excellent drainage, and provides a bed as deep as nine feet overtop the ever-present Campanian chalk—which these old vines reach down to for water. The wine is remarkable for its elegant power. 2007: In this vintage only the Corne Bautray was bottled; the other cuvées went into the 7-series. Winter and spring of ’07 were both mild and wet, while summer was cold with lots of storms until the end of August when good weather arrived. Corne Bautray was harvested on September 9th, 2007. It has 10.8 degrees of alcohol, 8.2 g/l of acidity. 430 cases of 750 MLs and 100 (3-pack) cases of magnums were bottled in June, 2008 and were disgorged in January 2016. Zero dosage. Pinot Noir Jacquesson stopped making blended rosés after 1997 in favor of rosé de macération (saignée) from a specific site, which better suited its philosophical outlook. This was done in 2003 and 2004, and the site chosen was Terres Rouges, a vineyard growing on a broad bench below the Reims Mountain but up above the town of Dizy. The red soil is limestone-based on top of chalky silts, and the Chiquets farm nearly 15 acres here, dedicating a 3.3 acre parcel of Pinot Noir planted in 1993 to the production of this rosé. In 2008, they tweaked the method of production, destemming all of the grapes and letting half of them macerate in tank for 25 hours (as was done entirely in 2003 and 2004); while the other half was "slow-pressed" during a 4-hour settling in the horizontal press. All of the wine was raised in older oak casks, and the dosage is 3.5 grams per liter. In 2009, they continued with the same method of production as the previous year. Harvest was September 19th and all of the grapes were destemmed and crushed. It has 11.7 degrees of alcohol and 6.5 g/l of acidity. 741 cases of 750 MLs and 100 (3-pack) cases of magnums were bottled in June 2010 and were disgorged January 2016. Zero dosage. Avize Grand Cru 2000 DT Chardonnay Spring temperatures in 2000 were the highest on record since 1956. July and August, however, were on the cold side and stormy until the end of August, when fine weather arrived. The harvest was consistent, healthy, and ripe. 122 cases of 750MLs and 38 cases of magnums were bottled in 2001 and disgorged in January 2016. Dosage 1.5 g/l. Millésime 2000 DT 50% Chardonnay, 50% Pinot Noir Spring temperatures in 2000 were the highest on record since 1956. July and August, however, were on the cold side and stormy until the end of August, when fine weather arrived. The harvest was consistent, healthy, and ripe. The grapes came from the Marne Valley, the Reims Mountain, and the Côte des Blancs. 122 cases of 750 MLs and 65 (3-pack) cases of magnums were bottled in 2001 and disgorged in January 2016. Dosage 1.5 g/l.